We’d love your help. 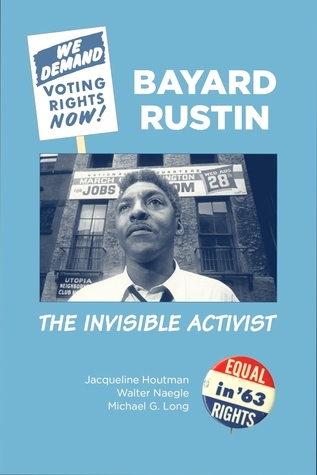 Let us know what’s wrong with this preview of Bayard Rustin by Jacqueline Houtman. To many, the Civil Rights Movement brings to mind protests, marches, boycotts, and freedom rides. They often think of people like Martin Luther King or Rosa Parks. They seldom think of Bayard Rustin. Raised by his Quaker grandmother to believe in the value of every human being, Bayard made trouble where ever he saw injustice. As a teenager, he was arrested for sitting in the whites only section of a theater. More arrests followed, for protesting against segregation, discrimination, and war. His belief in nonviolent action as a means for social change gave him a guiding vision for the Civil Rights Movement, which he used to mentor the young Martin Luther King, Jr. When A. Philip Randolph needed the best organizer on the planet, he turned to Bayard Rustin to bring 250,000 people to the March on Washington for Jobs and Freedom. To ask other readers questions about Bayard Rustin, please sign up. I want to give kudos to whomever did the layout. It's awesome. After reading this biography of Rustin I’m astonished at the impressive accomplishments of a man whose name is virtually unknown. Even though I had made it a point to learn about him in studies of the Civil Rights Movement, I didn’t realize he was a Quaker. Pop culture seems to be driving people (not just youth) to validate their lives through fame rather than through the good they can do for others. I’m excited that this title released as soon as it was ready. I’m sure it will find attention du After reading this biography of Rustin I’m astonished at the impressive accomplishments of a man whose name is virtually unknown. Even though I had made it a point to learn about him in studies of the Civil Rights Movement, I didn’t realize he was a Quaker. Pop culture seems to be driving people (not just youth) to validate their lives through fame rather than through the good they can do for others. I’m excited that this title released as soon as it was ready. I’m sure it will find attention during “Black History Month”, but history happens every day, and the stories of history-makers should fill our daily lives. I found this biography to be an ideal nonfiction read for fifth graders or people of any age who want to learn the truth about the way our society worked not even half a century ago. This is a very fully researched book about a complex figure in the history of the Civil Rights Movement. What an amazing story! I was ashamed that I call myself an activist, yet knew very little about Rustin. I plan on using this text and pairing it with the graphic novel March, and with some of MLJ JR's lesser known speeches. This is an accessible book for middle schoolers! I am sharing it at a Gay Straight Alliance meeting too. I had the pleasure of beta reading this amazing middle grade biography. I can't wait for this to be on library shelves. The amazing life story of an incredible man virtually erased from history because of his sexual orientation and commitment to pacifism. Excellent short biography, written in a way that makes it possible for older middle-schoolers through high school to glimpse the scope of Rustin's trajectory, challenges and triumphs (and those of the civil rights movement for which he worked so hard). Very quick read, I plowed through in a few hours. Lots of great insight into the life of a man who should be a household name. Although the book describes events and attitudes of eras gone by, they are presented in a way that allows readers to connect them with the era in which they live. Rustin's is a fascinating and unique story. Young readers will not only have a window into history, but can see their “own time” on issues such as acceptance and respect, homosexuality, and living your beliefs. Read why this was a Cybils Award finalist. It was FENOMENAL!! The authors couldn't have described and detailed Bayard's life any better. I learn so much, felt inspired by his biography; it was an easy book to read, since most of my generation does not know who he was or do not understand most of the events that took place in the 20th century. A great, simple history of one of my personal heroes.